I’ve been noticing that many teachers like using interactive notebooks with their classes. So I’ve done some research and decided to make one of my own. This type of activity utilizes all learning styles, visual, auditory and kinesthetic. It allows children to cut, paste, write, see and listen. Better yet, it keeps them engaged because they are doing things with their hands as well as listening and seeing. 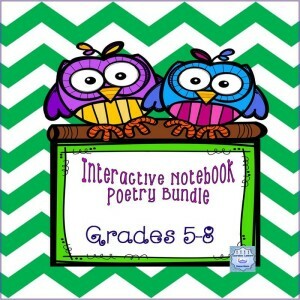 I’ve come up with an interactive-poetry notebook bundle. 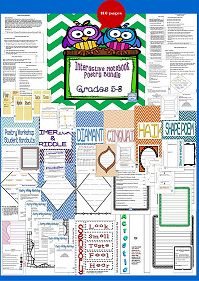 There are 100 pages of various types of fold-able templates that can be added to their notebooks. If you would like to make a regular booklet or have the class write poems to put on the bulletin board, color and black and white templates are also included. As a highlight of this poetry workshop, the class may pick their favorite poem and get it published in the anthology called Celebration of Young Poets- Creative Communication, Inc. I really enjoyed making this poetry bundle, it was a work of love. I hope you like it. I’m very open to comments and suggestions that you may have so don’t hesitate to make a comment.